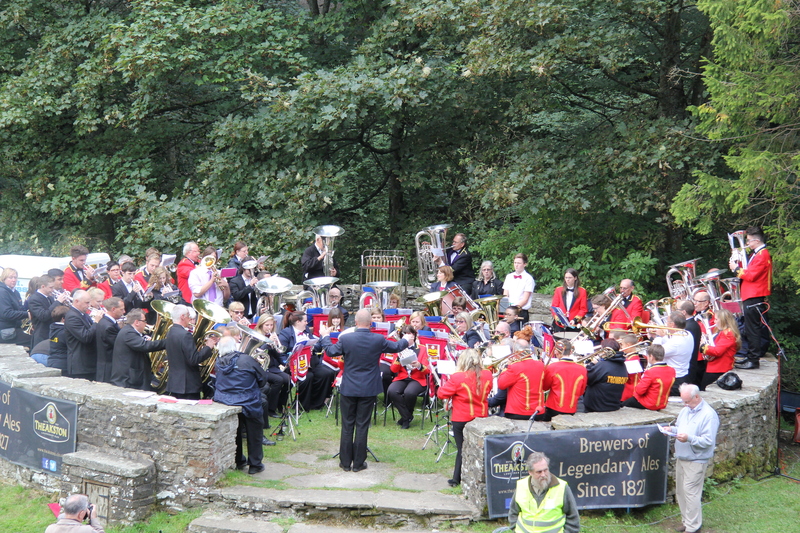 The Mid Band had a great weekend at the Hardraw Scar Brass Band Contest in Wensleydale, North Yorkshire. We left the bandroom on Saturday morning and despite a delay on the M1, arrived on time in Masham. We went straight to the Black Sheep Brewery for an afternoon of beer tasting and a brewery tour. When we were all refreshed we drove to Fearby, just outside Masham to The Black Swan where we spent the night. Sunday was contest day. After a rehearsal at our hotel we headed to the contest at Hardraw Scar, a waterfall just outside the village of Hawes. The band were drawn to play last in the contest so had a couple of hours spare to sit and listen to the other bands competing. Our programme, Castell Coch, Be Thou My Vision, Baggy Trousers, Introduction and Allegro Spiritoso (Eb Bass solo by Mary Sibson) and Game of Thrones was well received by a very large audience who were seated in and around the valley. As we were the last band of the day we led the massed bands in a short concert whilst the results were being finalised. The band were awarded 5th prize in the contest which was a little disappointing but never the less a very enjoyable weekend was had by all! ← The only way is Wessex!